Another delightful and sharply pointed excursion into the topics of the day, and of this day as well, with Gilbert Keith Chesterton. These reprinted magazine articles are filled with his good natured wit, his masterful use of paradox, and devastating ability to use reductio ad absurdum to destroy the popular myths that drive a society driving full-speed into secular humanism. You will come away with a whole new collection of wonderful quotes. . . .Similarly our England may have a right to congratulate itself upon the fact that her politics are very quiet, amicable, and humdrum. But she must not congratulate herself upon that fact and also congratulate herself upon the self-restraint she shows in not tearing herself and her citizens into rags. Between two English Privy Councillors polite language is a mark of civilisation, but really not a mark of magnanimity. Every time I read a book by Chesterton, I come away with a ton of quotes that I just want to memorise. This book is no exception. A collection of essays about odds-and-ends of the era. His first essay is on the empheral and how insignificant the essays all are -- and how their worst fault is that they are so serious, since he could not expend the effort to make them funny. If I were to rate this based on how often I actually agreed with Chesterton, this would probably get a two. Chesterton is an English Christian apologist from the early 1900s; I am very much none of those things, and I'm a feminist to boot. 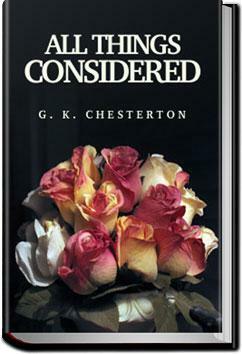 ENGLISH: A collection of press articles written by Chesterton and published as a book in 1908. His invectives about the press are still as applicable today as they were over one century ago. This was a highly entertaining read. While much of it had to do with the issues of Chesterton's day, his insight into things still applies today. There were a couple of times he rambled, but I still enjoyed every minute of this book. I literally LOL'd multiple times. Loved this collection of essays. Physics, you can take back your Diracs and your Einsteins. I raise you Chesterton, the maddest genius of his day.